If it has been a while since you’ve come to the beach, take a deep breath. It's time. The gentle breeze is still soothing just as the crystal-clear waves roll in from the emerald sea. The flawless white sand is just as soft as before, and the sea oats still dance for a glowing sun. Take that girlfriends' getaway you've been considering with indulgent spa days and boutique shopping	on the island. If it's a man-cation you're after, make it a deep-sea fishing challenge. Scuba diving and golf are more fun ways to spend time with the guys. Take a trip when kids are out for summer. The beach is glistening, and plenty of family-fun activities such as kayaking, sailing and renting wave runners make for a memorable vacation. Plan a picnic, build dreamy sandcastles and catch free live concerts at the beach. In fall and winter, Pensacola Beach’s “Secret Season” returns with mild temperatures, fewer crowds and incredible deals. Snowbirds know this secret and return to the area year after year. Whenever you visit, you’re sure to find yourself relaxed, refreshed and rejuvenated. With 450 years of history, more than 50 miles of beaches, world-class museums and a variety of great shopping, dining and entertainment, you won't have any trouble finding something to do in the Pensacola area. Without a doubt, Pensacola is best known for its white sand. Pensacola Beach was recently selected as one of the top 10 U.S. beaches by Trip Advisor. There are a number of great ways to enjoy ocean activities while you're in town. Go scuba diving and visit the USS Oriskany, a retired aircraft carrier that's now the world's largest artificial reef. Or stay above water and fish from the Pensacola Beach Gulf Pier, the longest in the Gulf of Mexico. Pensacola offers a wide variety of museums and attractions that are sure to please the whole family. Historic Pensacola Village, for example, celebrates the area's rich history, dating back to the earliest Spanish colonists. Or visit the National Naval Aviation Museum, one of the largest aviation museums in the world, and let the kids get up-close and personal with more than 150 airplanes. You’re also sure to find a festival, concert or other cultural event that will capture your imagination. 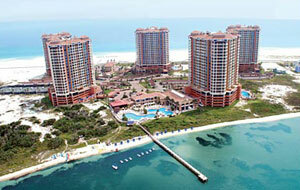 For more information on Pensacola Beach, click here.